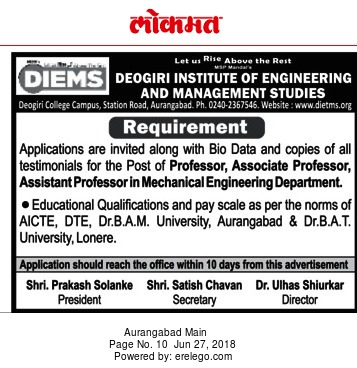 Deogiri Institute of Engineering and Management Studies, Aurangabad has advertised in the LOKMAT newspaper for recruitment of Teaching Faculty- Professor / Associate Professor / Assistant Professor jobs vacancies. Interested and eligible job aspirants are requested to apply within 10 days from 27th June 2018. Check out further more details below. About College : In pursuance with the policies of the Government of India to start Engineering colleges in emerging technologies, Deogiri Institute of Engineering and Management Studies is established at Aurangabad during the academic year 2009-10. Deogiri Institute of Engineering and Management Studies is affiliated to the Dr. Babasaheb Ambedkar Technological University, Lonere and is developed as per the norms of the All India Council of Technical Education (A.I.C.T.E. ), Government of India. How to Apply: Interested and eligible candidates are requested to send their Resume along with all copies of certificates / testimonials, copy of PAN card, copy of Aadhaar card and recent PP size photos to the postal address provided here.